Most people know about Black Friday and Cyber Monday …now Giving Tuesday is coming to Canada on December 2, 2014. SPES invites you to support Stanley Park with the gift of nature on Giving Tuesday. We work hard to connect people to nature. This year we’re focusing on supporting inner city students with a unique overnight outdoor experience. Nature Ninjas Urban Camping sends Grades 4 to 7 campers home with powerful memories, knowledge, skills and a new relationship to nature that will carry forward into their daily lives. 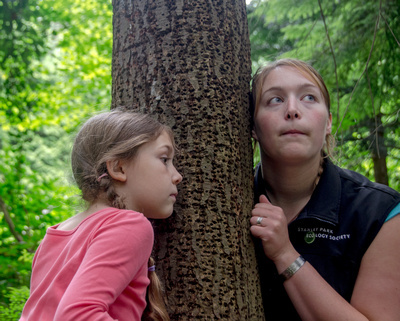 “Where else do you get to see your students hug trees, search for forest critters, quietly sneak up on beavers, overcome fears of the outdoors and have so much fun?” says Anita Georgy, SPES School Programs Manager. If you would like to help us continue to offer this immersive, memorable outdoor experience to Vancouver’s inner city schools, please click the “Donate Now” button to the right of this page. $25 will subsidize the Nature Ninjas program fee for one inner city student. $100 will enable three more of their classmates to join. All levels of gifting are appreciated and will be leveraged to support this important program.